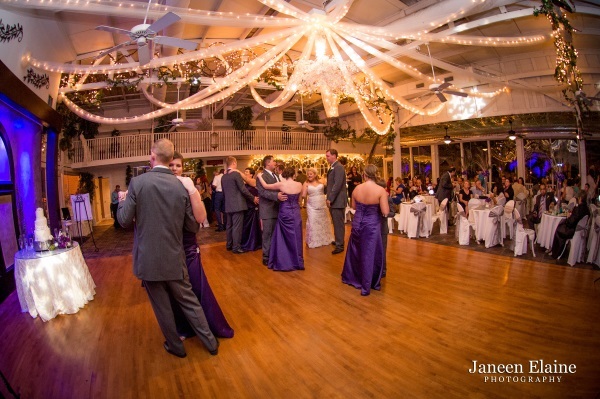 Our wedding facility is focused on creating a wonderful, charming ambiance for your wedding – but we also understand that the wedding reception is a very special event for the wedding party and guests alike. That’s why we’ve created a spacious yet intimate and elegant glassed-in atrium where your wedding reception will be held in style. The room overlooks a candlelit pool – and your guests may socialize both indoors and outdoors, or even take a stroll through our immaculate grounds. Our wedding hall and staff are here to provide everything you need to make your wedding reception a spectacular success. We’ll handle the catering while providing you with four delicious menu options to choose from at various prices. We also offer you several bar packages that include set up, bartenders, champagne for toasting and champagne for the honeymoon suite. Music can be provided by our in-house DJ – or you may provide your own DJ or band if you prefer. In addition, our wedding facility offers a decorating package that includes centerpieces, garland and our gazebo for the wedding ceremony – as well as linens on the cake tables, floral arrangements and more. And, of course, our honeymoon suite is one of the most charming and romantic aspects of our wedding hall. Styled to match the Antebellum look of the house, the newlywed couple will find a complimentary bottle of champagne awaiting them in the suite – and they’ll also enjoy access to the Jacuzzi and swimming pool. To top it all off, the newlyweds will be served a scrumptious southern breakfast the following morning. You’ll enjoy all this and more when you choose Sunny Meade as your wedding facility.